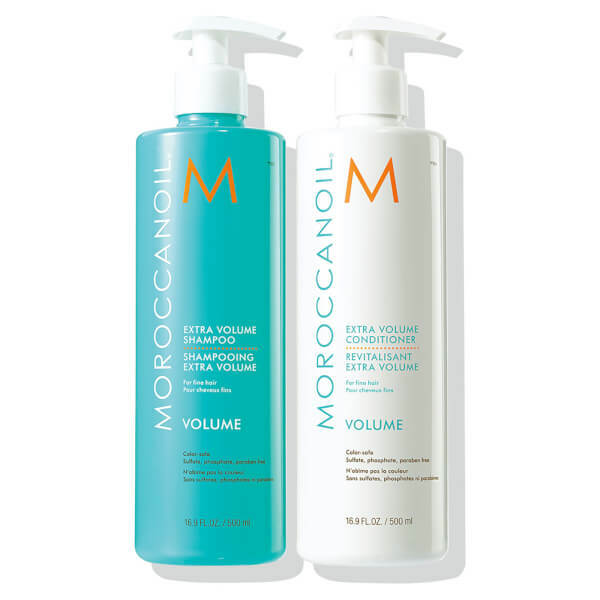 Transform dull, lifeless and thin hair with the Moroccanoil® Extra Volume Shampoo and Conditioner Duo. Combining two complementary colour-safe treatments, hair is left looking volumised and full of vitality with a mirror-like shine. Free from parabens, sulfates and phosphates. Infused with antioxidant-rich argan oil and revitalising nutrients, including Linden Bud extract, the shampoo naturally plumps up the look of hair, working to restore health and bring back body, shine and manageability. Impurities and excess oils are eliminated, leaving hair weightless and lifted. The gentle, lightweight conditioner infuses hair with a concentrated dosage of Argan Oil, working to smooth and soften individual cuticles whilst plumping them with uplifting nutrients including Linden Bud extract. Hair is left manageable and detangled with a healthy-looking gloss and boosted volume. Massage shampoo throughout wet hair and scalp. Continue to add water to activate a rich, luxurious lather from the highly concentrated formula and stimulate its volume-boosting properties. Rinse thoroughly until water runs clear. Repeat if needed, and follow with conditioner. Shampoo: Aqua/Water/Eau, Sodium Lauroyl Sarcosinate, Cocamidopropyl Hydroxysultaine, Parfum/Fragrance, Cocamidopropyl Betaine, Cocamide Dea, Glycerin, Polyquaternium-70, Peg-150 Pentaerythrityl Tetrastearate, Argania Spinosa (Argan) Kernel Oil, Tilia Tomentosa Bud Extract, Glycol Distearate, Laureth 10, Dipropylene Glycol, Acrylates/Palmeth-25 Acrylate Copolymer, Peg-6 Caprylic/Capric Glycerides, Cocamide Mea, Polysorbate 20, Peg-20 Glyceryl Laurate, Tocopherol, Linoleic Acid, Retinyl Palmitate, Diethylhexyl Syringylidenemalonate, Caprylic/Capric Triglyceride, Butylene Glycol, Chondrus Crispus (Carrageenan) Extract, Ascophyllum Nodosum Extract, Palmaria Palmata Extract ,Laminaria Saccharina Extract , Undaria Pinnatifida Extract, Sodium Chloride, Citric Acid, Phenoxyethanol, Caprylyl Glycol, Chlorphenesin. Conditioner: Aqua/Water/Eau, Dimethicone, Cetearyl Alcohol, Parfum/Fragrance, Behentrimonium Chloride, Canola Oil, Glycerin, Tilia Tomentosa Bud Extract, Hydrolyzed Vegetable Protein Pg-Propyl Silanetriol, Argania Spinosa (Argan) Kernel Oil, Butylene Glycol, Lamium Album Flower Extract, Pinus Sylvestris Cone Extract, Arctium Lappa Root Extract, Anthemis Nobilis Flower Extract, Rosmarinus Officinalis (Rosemary) Leaf Extract, Hedera Helix (Ivy) Extract, Arnica Montana Flower Extract, Nasturtium Officinale Extract, Allium Sativum (Garlic) Bulb Extract, Phenoxyethanol, Isopropyl Alcohol, Caprylyl Glycol, Citric Acid, Chlorphenesin, Butylphenyl Methylpropional, Hydroxyisohexyl 3-Cyclohexene Carboxaldehyde, Linalool, Alpha-Isomethyl Ionone.